Would you use a placenta supplement and placenta skincare? While applying it topically is new, ingesting placenta is not. Placentophagy, eating ones own placenta for health benefits, is a common occurrence in the animal kingdom (most mammals ingest their expelled placenta after giving birth) and it has been a practice used in Traditional Chinese Medicine since the 1500s mixed with human milk to alleviate ailments, such as anemia, exhaustion, pain relief, prevent miscarriages and sexual dysfunction. 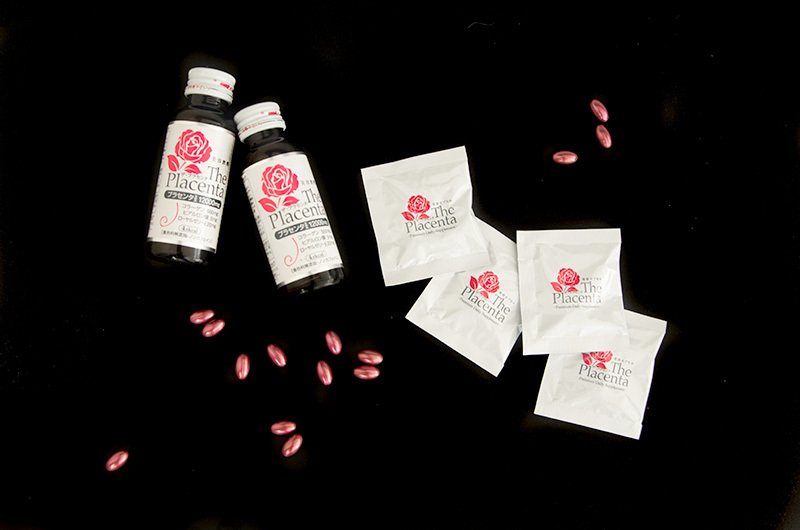 Placentophagy has become recently quite trendy among celebrities, women in wellness communities, like San Francisco, Denver and Los Angeles and beyond. The practice is hotly contested, as few sound scientific studies have been conducted confirming the purported postpartum benefits (which we explore here), such as reestablishing a hormonal balance, staving off postpartum depression, helping with fatigue and producing breast milk. But that hasn’t stopped women from encapsulating, blending into smoothies, and/or cooking and eating their placentas. According to the American Pregnancy Association the placenta transports nutrients, oxygen and waste between the fetus and the mother, while also producing hormones, such as chorionic gonadotropin (hCG), estrogen and progesterone. It’s these hormones and growth factors, along with amino acids, proteins and enzymes found in the placenta that Japanese bio-tech companies, like Japan Bio Products, argue give placenta its inherent anti-aging capabilities: immuno-stimulant, cell proliferation, moisturizing properties, collagen stimulation and UV protection. Though there have been limited studies supporting ingesting placenta for postpartum benefits, there have been quite a few published animal studies on the benefits of ingesting a placenta supplement and applying it topically for anti-aging skin benefits. Like this study published in the Korean Journal For Food Science of Animal Resources in 2015 which showed pig placenta extract, when taken orally, reduced trans-epidermal water loss, UVB-induced wrinkle formation, and significantly lowered the collagen degrading protein, mRNA, in hair-less mice over a twelve week period compared to a control group given a placebo. Or this study published in the Journal of Tissue Engineering in 2013 that reported human placenta growth factors greatly improved the speed of wound healing in rats when applied topically. No wonder placenta is everywhere in Japan. But where exactly are all these placentas coming from? Many of the Japanese products I picked up, including the PLift Placenta + Vitamin C masks and No. 1 Japan The Premium Daily Placenta Supplement use pig placentas, though other brands I came across in Tokyo use horse or sheep placentas. With most incorporating other powerful anti-aging actives into their placenta products, like collagen, peptides, and hyaluronic acid. And it’s not just the Japanese utilizing placentas in skincare. Esteemed dermatologist to the stars whose clients include Harry Styles and the ageless-sold-her-soul-to-the-devil-for-that-skin-and-body Jennifer Lopez, Dr. Harold Lancer, used to offer a Signature Placenta Facial using a placenta soaked fabric mask and Placenta Facial cream at his Hollywood clinic. Though, he’s since changed it to a Signature Stem Cell Facial – maybe people in the states weren’t ready for placenta skincare?